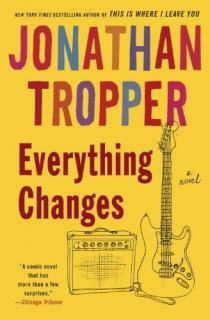 Okay, this was Jonathan Tropper's first novel. I am uncertain why I decided not to read it when I was on my Tropper kick, but I didn't, which meant I could read it this month. The story is cute. Tropper's style is pretty apparent early on with this book. I'm glad this book had enough success that he was able to keep writing, as I liked his later books, too. That five people could be best friends in college and manage to keep the best friend status through all of the subsequent years I find to be the most fictional of this fiction, but I'd like to believe it could happen. 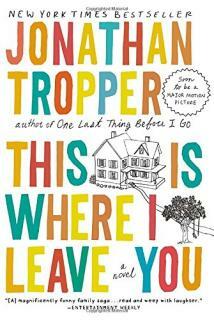 I enjoyed the book, and would recommend it to anyone on a Tropper kick. 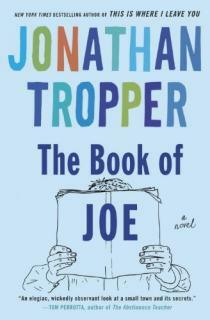 If you want only one Tropper book, make it the Book of Joe. If you want a quick, light, delightful read, this is a good one. To know him was to know a man of absolute contentment, a loving husband and father, a great friend, a Godfearing man whose ample intelligence did not serve to complicate him, as it does so many people. I was scared shitless of reality. That it might be something other than this. Chuck always employed the Socratic method of viewing television shows. He didn’t seem able to enjoy himself without his pointless commentary. On my little mini-Tropper kick, I picked up this book and read it quickly. I can still claim this to be a Mom-stack book, in a fashion, given how nearly all the other Tropper books I've read were Mom-stack books. Or not: I read it because I enjoy his writing style. 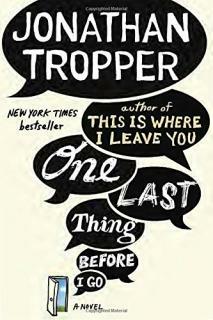 This book wasn't as outrageously amusing as Tropper's other books, though it still had some laugh-out-loud parts. I'm not sure how much amusement you can put into the story of a man who has a short time to live if he doesn't have an operation to save his life, but Tropper manages a good amount. The thing that sticks with me with these last two Tropper books is the idea of falling in love with the girl walking by. Trooper describes Judd and Silver as both falling in love with the imagined story of this girl as she rides by, or that girl as she serves coffee. The idea of falling in love, of having those crushes, and enjoying the emotion, basking in the warmth of it, just rings delightful with me. It is in such contrast with the idea of One True Love That Survives The Ages™ that is this gold standard, impossible ideal of the lonely heart. I enjoyed this book, as with all the Tropper books (just don't read them one after the other, they lose their delight). The ending was perfectly ambiguous. You know when you go see a movie, and all the readers who have read the book the movie is from say, "Ugh, the book was better!" and you think, "Okay," and decide you won't ever read the book? Right. Because reading the book, THEN seeing the movie is the correct order to experience a plot. Really. When I started this book, which I deliberately picked up because it is by Jonathan Tropper and I have enjoyed his other books, I keep thinking, "Ehhhhhhhhhhh, I feel like I have read this book," but I couldn't find it in my list of read books, so maybe I hadn't read it. Which is to say, I read this book at lightning speed because I really really really really felt I had already read the book. Turns out, no, I hadn't read the book, I had seen the movie. Well, the last two thirds of the movie, anyway. I came across it while channel surfing and watched it because Timothy Olyphant is in it, and, well, after Sheriff Bullock and Marshall Givens, I'll pretty much watch most things Olyphant is in (and because, come on, he has a really cool last name, too). So, yeah, the movie is STUNNINGLY close to the book. I knew all the plot twists and many of the jokes, and I have to say, if you've seen the movie, skip the book. If you've read the book, skip the movie, because the book has how the movie should have ended. 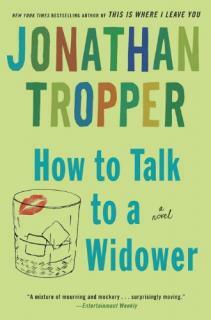 The third of three books I have by Jonathan Tropper from Mom. As predicted, I ripped through them in a week. I liked this book a lot. A large number of literally-laugh-out-loud parts that I laughed out loud to. I currently have enough empirical data to state Tropper's style is first person narration of a guy who has had someone close to him die, has a screwed-up-in-some-way family, and is trying in some way to get his life back together in a way where he can move forward. In this book, yup, that's the plot. The narrator's wife died a year before and he is still grieving. He is rather sucking at moving on, despite his screwed up family attempts to help him. He has a twin sister, another little sister, an actress mom and a doctor dad. Things aren't particularly clean, though, as he's more than a little odd, even before he met his now deceased wife, his family is screwed up in odd ways (but still family), and, well, as the book shows so well about human nature, sometimes you just want to keep the pain, wrap yourself in it, and use that cloak of pain to keep everyone else away. The book has enough truth in it about human nature and how we are all screwed up that I suspect anyone reading it will find himself in the book somewhere. Or maybe discover something new about human nature (as I did: that guys will trim their pubic hairs to make their penises look bigger. Who knew?). This is the second of three Tropper books I have from Mom. I enjoyed the first one well enough that I am likely to rip through all three, maybe this week. This one was much shorter than the previous one I read, the Book of Joe. It was a harder read than the first one, as the first person narrator (same as the Book of Joe, this might be the author's style) has a friend who died (come to think of it, so did Joe in the last book). The basic premise is that the narrator is engaged to be married to one woman, and in love with his dead best friend's widow. How's that for sucky? This was a shorter read, less amusing than the previous one, more talk talk talk, and that's okay, the book was a good read. I liked the ending, full of hope after a serious screw up. If you're ripping through Trooper books, include this one. Otherwise, skip it for one of the others. This is another one of those books my mom bought and I had around, so I figured I would go ahead and read it. 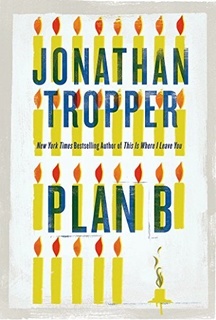 It is the first of three books I have by Jonathan Tropper, having read nothing about the book or by this author before. I was delightfully surprised by this book. It was tragic and amusing and entertaining and funny all. I really enjoyed the book. The basic plot is a guy has a crappy childhood in a small town where basketball is king, has no connection to his widowed dad, has no connection to his basketball-star older brother, moves away, writes a book about said small town (exposing everything, making up a lot of things), becomes a success with said book, and returns to the town 17 years later. The book is written in the first person from the male perspective, in a light, self-effacing way. I enjoyed the book a lot, and lit in immediately to the second of three Tropper books I have from Mom. Sound bite from the book that I keep coming back to: "you know [a past love] was true love when it hurts, time doesn't heal the pain, and it's too late."